Addicted to sweets? Satisfy your sweet tooth with some delicious fruit! Most fruit is low in calories and contains lots of fiber and beautifying antioxidants! Have any of you tried frozen fruit? Delicoussss!!! I especially love frozen grapes and berries-they hit the spot just perfectly :)! 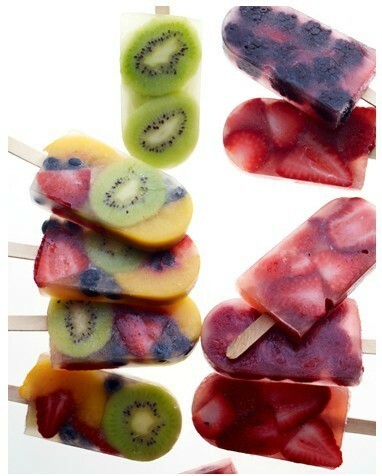 When I have some free time, I like to make frozen fruit pops. I add my fav fruits with a splash of juice. I just stumbled upon the below recipe which looks Divine! and I just had to share it with you guys :)! I can’t wait to try it out!! Combine diced fruit in a bowl and fill each 5 oz cup with fruit. Add 1 tbsp of juice and insert craft sticks into each cup. They easily stay in place because of all the fruit. Place in the freezer a few hours until firm. To remove the pops from the cups, run under warm water a few seconds.